White color spray paint (get white primer). One can will easily spray three bottles, maybe four. Floral stems, holiday ornaments, clear glass beads. Use or purchase whatever you want to personalize your arrangement for the season. Mine happened to be Christmas. 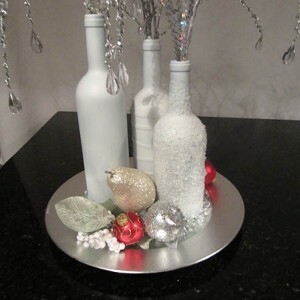 Serving tray to hold the bottle centerpiece. I used a silver charger plate that I picked up at Michael’s a while back. I think I paid $2.99 for it. It worked well. You can even look for trays at garage sales or Goodwill. Spray paint the color you want. No need to spend big dollars. You don’t have to cut the bases of two bottles, but it does lend more interest to the finished arrangement if you do. I purchased my bottle cutter online here. I did a few practice cuts first and it didn’t take long to get the hang of it. Occasionally you will have a cut that is not even, don’t sweat, it happens. The other secret is to NOT use really heavy wine bottles. The thicker glass bottles don’t break evenly at the cut line. You will want to remove the labels from the bottles. Just soak the bottles in hot, soapy water and the labels should come off easily. If you have one that’s stubborn, use some goo-be-gone after soaking. Dry the bottles thoroughly. 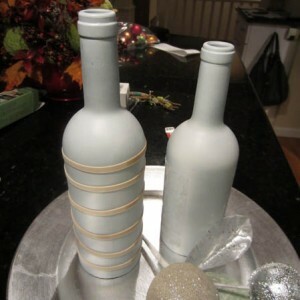 You can take some sandpaper to each bottle if you like to help the paint better adhere. I knew my bottles were not going to be washed or moved around, so I didn’t bother. Spray a light coat of paint on the bottles. Allow to dry and continue with a second layer. It will take 3-4 layers to get a nice even coat. You don’t want any drips, so spray lightly. Allow paint to dry between coats. 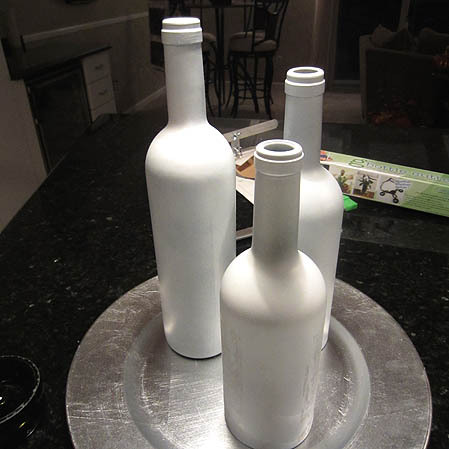 Once painted, set bottles aside to completely dry. To add texture, I placed rubber bands around one of the bottles before spray painting. I left one bottle plain with a smooth finish (though I’m thinking about adding some adhesive silver gemstones) and one bottle was rolled in espsom salt. Lay your salts out on a cookie sheet lined with foil. 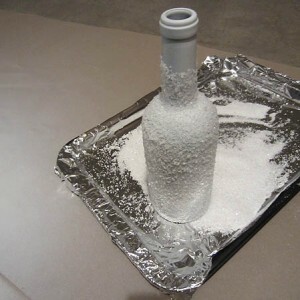 Spray bottle with the adhesive and roll bottle in the salts. Spray finished bottles with a clear coat of lacquer. Arrange on tray with your floral goodies. 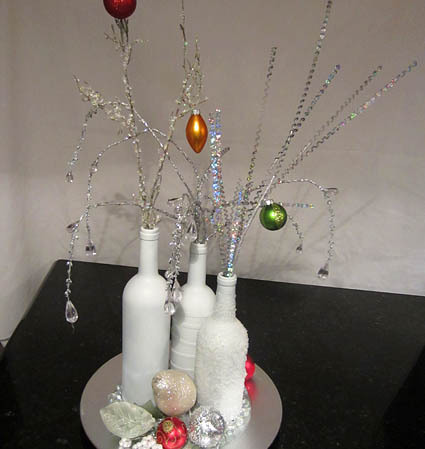 I added clear glass stones around the base of the bottles along with ornaments and a floral pick. The decorating ideas for repurposed wine bottles are endless. I’m gifting a few of these this holiday. T.A. My husband is in the wine business and attends many events. There is never a shortage of wine bottles around here. I have a friend in my Bunco group that recycles the bottles for glass art. Some of here stuff is pretty awesome. I see in your post that you bought your bottle cutter in delphi glass, how’s their product? It has worked well and not terribly expensive.